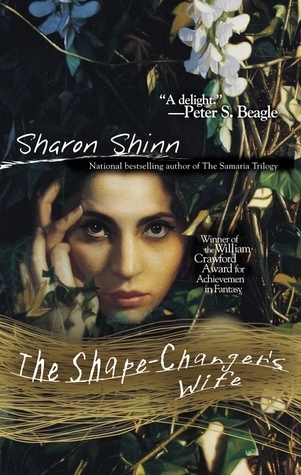 The Shape-Changer's Wife has been on my shelf for six years now, but I admit I only picked it up because I wasn't sure what I was in the mood to read, and it's a pretty slim volume. Sharon Shinn's novel is about Aubrey, a young wizard sent to learn transmorgification from Glyrenden, an older wizard who is disliked by everyone who knows him and feared by all the animals in the forest. Aubrey meets Glyrenden's wife, Lilith, and his servants, Arachne and Orion. All of them are a bit odd. But Aubrey is so excited to learn from Glyrenden that he doesn't think much about it. However, as Glyrenden spends more time away from home and Aubrey spends more time with Lilith, he realizes that things are not quite what they seem and that Glyrenden has horrible deeds in his past. Is Aubrey strong enough a wizard to take on a master like Glyrenden? This book was written for young adults, but I can't imagine many people reading it and not catching onto "the thing" pretty early on in the story, certainly much earlier than Aubrey. But Shinn has a wonderful way with words, and so I didn't mind too much that Aubrey seemed denser than everyone else in the story. Perhaps because he was so taken up with Lilith. Lilith reminded me a lot of Sybel from The Forgotten Beasts of Eld. She is untouchable - she doesn't have any strong emotion, she doesn't seem to care much about what is happening around her, and she pays very little attention to people when they are not talking directly to her. She isn't classically beautiful, but she draws men to her through a tantalizing mix of complete unconcern and lonely vulnerability. I didn't love this book. There isn't a lot that happens, though it's so short - just over 200 pages - that I suppose not much can happen. It's unfair of me to complain about its length when I picked it up solely because it was so short. But considering that I knew "the thing" less than halfway through the story, I was annoyed that the consequences of that were dealt with so shallowly. Rather than any great events happening for most of the story, it's small things that build upon each other. That was also similar to The Forgotten Beasts of Eld and Jo Walton's Among Others. Except Walton did amazing, wonderful things to build tension and Shinn didn't quite accomplish that for me. As I had already guessed the point of tension, there wasn't much of anything to build for me. I knew what was coming, and when it came, I was not surprised. This was a quick read, and I'm glad to have gotten it off my TBR list, finally! But it's not one I'll revisit in future. It doesn't sound like this is a must read for fantasy lovers, since "the thing" is dealt with so early on in the story, but now that you have read it, there is one less book cluttering your shelves at least. I also don't get the whole vulnerable but unconcerned woman thing, because as far as characters go, I find that pretty annoying in the fiction that I read. I'm sorry that this one didn't totally work for you! Hmm, too bad! The cover is lovely, and the premise a bit interesting -- sometimes a skinny novel can pack a punch, but when it doesn't, it really can disappoint. I felt the same way--there was nothing wrong with it, but there's not much to it. It was her first book. 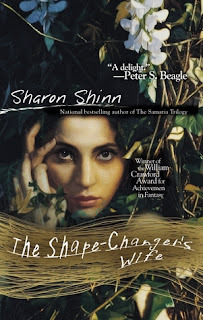 But I do feel like you keep getting hit with the least awesome Sharon Shinn books--she's one of my favorites based mostly on the Samaria series (which is SF/Fantasy romance) and the Safe-Keepers series (which is definitely small-focused and methodical, but so charming). But I know I've said this in the comments before! 1. Sharon Shinn is not my friend from that time she wrote a sci-fi adaptation of Jane Eyre where (spoiler alert) the wife was a cyborg. Or something comparably weird. 2. I'm tired of this "The X's Wife", "The Y's Daughter" thing with titles. It's lazy and I want everyone to stop. Interesting review. When this book came out it gained so much positive attention, I bought it. Like you, I worked out the issue within the first third of the book, and found it to lack in emotional substance after that, although the potential for intense feelings was there. Aubrey was sweet and engaging, but in general the style was too detached to really enjoy. But I felt I *ought* to love it because everyone else did. I've found Shinn's later books to be exceedingly different, although rather hit-and-miss in terms of quality. Some are wonderful, some are ... not for me. Too bad this book didn't work out but at least you can take it off your tbr pile. I think I'll avoid this one and try Among Others instead. I agree with Jenny about X's Wife and X's Daughter. I feel the same way about covers with headless women! I have to admit that Shinn is one of my go-to guilty pleasure authors - I absolutely love her Archangel series. I am aware, however, that her YA is not necessarily up to par. And I agree with Jenny above - that Jane Eyre knock-off was unreadable.